This page covers Electronics equipments for test and measurement. The common Electronics equipments include voltmeter, ohmmeter, ammeter, multimeter, oscilloscope, signal generator, pulse generator, pattern generator, frequency counter, LCR meter etc. As we know advancement in electronics device industry has given us calculators, watches, mobile phones, laptops, speakers, computers, TVs, washing machines, refrigerators and more. These components are used in various instruments wide across the industries viz. medical, communications, test and measurement, control, manufacturing, process and so on. The electronic systems use large number of components including resistors, capacitors, inductors, diodes, transistors, switches, transducers or sensors, LEDs, LCDs, ICs etc. The electronic circuits use these components. The electronic circuits are divided into two types viz. analog and digital. Following are the measurements performed in electronics circuits. Resistance (R) : Electrons move more easily through some materials than others when a voltage is applied. Opposition to current flow in a circuit is called resistance. Examples: Conductor has low resistance, insulator has high resistance and so on. It is measured in in units of Ohms (symbol : Ω). All the three parameters viz. R, V and I are expressed using following equation. It is called as Ohm's Law. Voltage (V):	An electromotive force or potential difference across two terminals in a circuit is known as voltage. It has units of volts. It is related to resistance and current as per Ohm's law as mentioned above . Current (I):	When a voltage is applied to the circuit electons flow from negative to positive terminals of a battery. The current flows from positive to the negative terminals of the battery. It is measured in units of amperes. Impedance: If AC supply of rms voltage 'V' and frequency 'f' is applied to series circuit consisting of (R, L, C) then each component offers some opposition to the current. This opposition is known as impedance (Z). It is also measured in Ohms. It is expressed as follows. Frequency: The number of cycles occuring in one second is known as frequency. It is measured in units of Hz, KHz, MHz, GHz etc. Both period (i.e. T) and frequency (i.e. f) are related as per following equation. Pulse: Often it is required to measure pulse amplitude, frequency and repetition rate. All these are measured using oscillscope. Jitter is another useful term used during pulse pattern measurements. Following are the functions of common electronics equipments used for test and measurement. • Ohmmeter: It is used to measure resistance. • Voltmeter: It is used to measure voltage or potential difference across two points in a circuit. It is connected in parallel to the measurement points. • Ammeter:	It is used to measure current through some path in the circuit. It is connected in series where current is to be measured. In order to do so circuit is broken in order to put Ammeter into the circuit path. • Multimeter: It is used to measure V, I and R all the three parameters. It is basically combination of all the three meters Ohmmeter, Voltmeter and Ammeter. There are two types of multimeter viz. analog and digital. Refer comparison between Analog multimeter vs Digital multimeter for more information. • Oscilloscope: It is used as time domain measurement tool. It helps in measurement of time varying signal voltages. It can plot one or more signals amplitude over time. Usually x-axis represents time where as y-axis represents voltage. It can be used to measure various waveforms such as sine wave, square wave etc. It is popular for measurement of eye patterns. It is one of the electronics test equipments widely used. Now-a-days digital storage oscilloscopes are available to analyze high frequency signal vectors. • Signal Generator: It functions as signal generator as per user configured amplitude, frequency and duty cycle. Various types of signal generators are available e.g. low frequency or high frequency, scalar or vector. • Pulse or Pattern generator: It is one of the electronics equipments used for digital circuit testing. It helps in simulating desired pulse pattern which is used as input for testing digital circuits. Various signal formats such as TTL, LVDS etc. can be simulated. • Frequency counter: It is used to measure frequency of repetitive signals. There are frequency counters available for lower frequency as well as higher frequency measurements. • LCR meter: It is used for measurement of capacitance, inductance and resistance of electronics components such as capacitor, inductor or coil and resistor respectively. 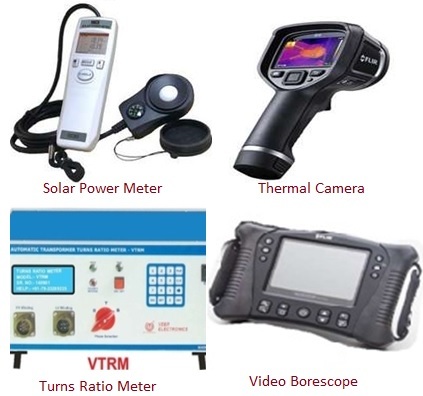 There are other electronics equipments such as BER tester, solar power meter, turns ratio meter, video borescope, ESD ionizers etc. Following are the popular electronics test equipments used for testing various electronic circuits and devices. The common measurements performed using these equipments include voltage, current, resistance, impedance, capacitance, inductance etc. as explained above. Digital Oscilloscope: This page of equipments section of T & M World covers Tektronix TBS1052B Oscilloscope. It mentions features and specifications of TBS1000 series of digital oscilloscopes from Tektronix. Other vendors of digital storage oscilloscopes are also mentioned. MHz Oscilloscope: This page of Test and Measurement Equipments Section covers MHz Oscilloscope series. It covers 10 MHz, 50 MHz, 100 MHz,200 MHz, 500 MHz oscilloscopes from reputed manufacturers Keysight, Tektronix, Teledyne Lecroy, Yokogawa, R&S etc. GHz Oscilloscope: This page of T & M equipments cover GHz Oscilloscope Series. It covers 1 GHz, 2 GHz, 3 GHz, 4 GHz Oscilloscope from reputed manufacturer companies. Transformer Turns Ratio Meter: This electronics equipment is used for testing transformer turns ratio. Video Borescope: This page describes Video Borescope basics. and mentions FLIR VS70 Video borescope features. It also mentions benefits of FLIR VS70 Video borescope equipment. ESD Control Ionizers: This page describes basics and types of ESD Ionizers. It mentions basic working principle of ESD control ionizer. Climatic chamber: This page describes Climatic Chamber basics. It mentions features of Climatic Chamber from CM Envirosystems Pvt. Ltd. It also mentions other vendors of climatic chamber. Bit Error Rate Tester: This page covers Bit Error Rate basics and mentions Bit Error Rate Tester from Tektronix. Other vendors of Bit Error Rate testers are also mentioned. Solar Power Meter: This page describes Solar Power Meter basics. It mentions general specifications of Solar Power Meter. It also mentions Solar Power Meter vendors or manufacturers. Thermal Camera: This page describes Thermal Camera basics. It mentions general specifications of Thermal Camera. It also mentions Thermal Camera vendors or manufacturers.